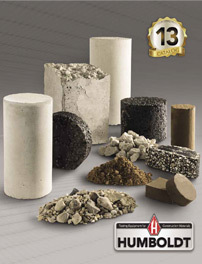 For sampling hydraulic cement in bulk shipments or bulk storage. Has two polished brass telescopic tubes with registering slots (with partitions) that open or close by rotation of the inner tube. Outer tube has sharp point to facilitate penetration. Sampler is 1.375" (35mm) dia. x approximately 63" (160cm) long. Multiple weighing units, RS-232/USB interfaces, battery or AC operation, capacity tracker.